Capturing Latino market | ¡Hola desde NJ! Kellogg’s is a brand rich in heritage for the majority of U.S. Hispanics who grew up calling all cereal ‘Konfleis’ and eating Zucaritas with Tigre Toño. Building long-term relationships with Latinas online is increasingly important for Kellogg’s and other CPG companies. Hispanics spend more on groceries and make more grocery trips when compared to the total U.S. population . What’s more, Latinas are extremely digitally savvy and are more likely to purchase products online or purchase products in store based on online information . In response to these trends and to create a mutually beneficial relationship with Latinas online, Kellogg’s selected Hispanic digital agency Captura Group to create a multi-brand, multi-platform community aimed at driving loyalty through authentic and culturally relevant content. 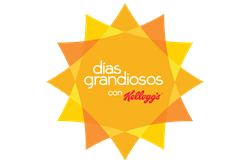 Captura Group worked with Kellogg’s to develop the Días Grandiosos (Great Days) program, whose purpose is to bring a ray of sunshine into the lives of Latina moms by inspiring them to make today and everyday great, one moment at a time. Días Grandiosos comes to life through a journalistic content marketing approach that features stories about real Latina women and their families across topics that they care about and are relevant to Kellogg’s brands. Thirteen Kellogg’s brands, including Frosted Mini-Wheats, Eggo, Froot Loops, Pop Tarts, Nutri-Grain, Cheez It, Rice-Krispies, Special K, Pringles, Frosted Flakes, Corn Flakes, and Apple Jacks, are integrated organically across the Días Grandiosos community and on dedicated brand pages. The centerpiece of the Días Grandiosos community is a fully responsive website that allows Latinas to explore authentic and relevant stories on their desktop, tablet, or mobile device. They can also engage with Días Grandiosos on Facebook and Pinterest.